The most cutting edge in duplication technology, our Intelligent 9 series SD/Micro SD duplicator is professional, standalone and efficient. It can duplicate a full range of SD/MicroSD memory cards starting from 7 and up to 119 targets. Speed and flexibility are key factors in satisfying customer needs. 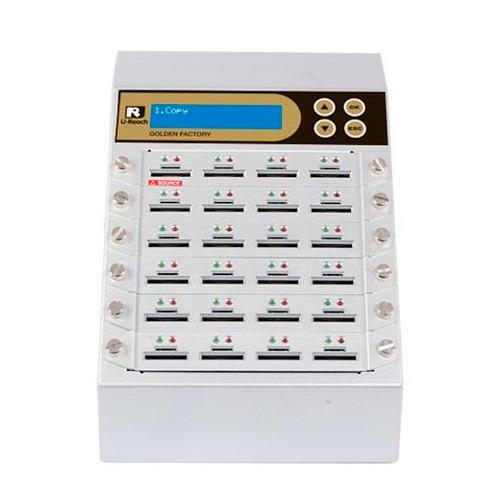 Its effortless use means a PC or other software are not required; the SD/MicroSD memory card duplicator provides a reliable, worry-free copy environment for users, without the risk of virus corruption. This Combo SD/MicroSD duplicator series is integrated with a high-speed compare function to ensure data copies with 100% accuracy. It also boasts quick format capabilities. These features greatly help increase efficiency and production productivity. After the duplication task is completed, the Intelligent 9 duplicator will automatically cut down the power and signal to devices. Users can remove the device directly without any concern.